An excellent venue with the portable track laid on a tarmac path, requiring no packing, giving a very stable ride. Tankersley make up any shortfall in takings to an agreed hire charge. Passengers carried: • 2012 - 55 very showery day • 2013 - 92 • 2014 - By mutual consent decision taken not to do Tankersley event. Beighton Gala. Generally a well attended event, track is laid on grass therefore requires a certain amount of packing, although reasonably level. Passengers carried: • 2012 - Cancelled due to ground conditions. • 2013 - 280 • 2014 - 320 Maltby Gala. A new event where Maltby Parish Council make up any shortfall in takings to an agreed hire charge. Passengers carried: • 2013 - 303 • 2014 - Not invited. Greenhill and Bradway Tennants Association, Lowedges Festival. Generally a well attended event, track is laid on grass therefore requires a certain amount of packing, although reasonably level. Good location amongst other attractions. As well as RDMES keeping all fares taken, Greenhill and Bradway pay us a hire fee, therefore a good profitable event to attend. Passengers carried: • 2012 - 186 • 2013 - 331 • 2014 - 107 passengers. The low turnout was due entirely on the remnants of Hurricane Berta with heavy rain until early afternoon followed by heavy showers. The event was a disappointment for the organisers as many of the exhibiters failed to turn up. Fortunately due to a very generous donation from the organisers it was still worthwhile for us. 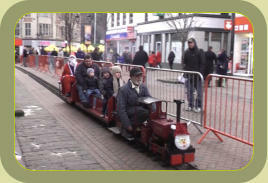 Rotherham Town Centre Events. Passengers carried: • 2012 - "Queen's Jubilee Street Party". A very successful day when 648 passengers were carried. As well as the income generated, which included a donation from Rotherham MBC, the event enabled us to fully publicise our site in Rosehill Park which in turn should boost our income in the park. • "Santa Special Event. Another decent day when 329 passengers were carried, again supplemented by a grant from Rotherham MBC. Thanks to John Cox for volunteering to act as Santa. • 2013 - "Dickensian Event" - 486 passengers carried supplemented by grant from Rotherham MBC. • 2014 - "Dickensian Event" - 279 passengers were carried, The reduction on 2013 may have been due to it being an extremely cold day. However due to an increase in fares our remuneration was slight up on last year. This was also supplemented by a generous grant from Rotherham MBC.